Wife of the nation’s 41st president and mother of the 43rd president, Bush died at home in Houston April 17 surrounded by family. She was 92. A day for members of the public to pay their respects will be followed the next day by a private, invitation-only funeral. For the public viewing April 20, her body will lie in repose at St. Martin’s Episcopal Church in Houston, where the private funeral will take place April 21. President George H.W. Bush and his wife attended services there regularly. She will be laid to rest on grounds of the Bush Presidential Library at Texas A&M University in College Station. “Her family’s generous and compassionate decision to invite the public to her viewing to say their farewell touchingly demonstrates how much she has been part of the Houston community,” Cardinal DiNardo said April 18. Cardinal DiNardo also conveyed papal condolences sent by Cardinal Pietro Parolin, the Vatican’s secretary of state, via Archbishop Christopher Pierre, apostolic nuncio. 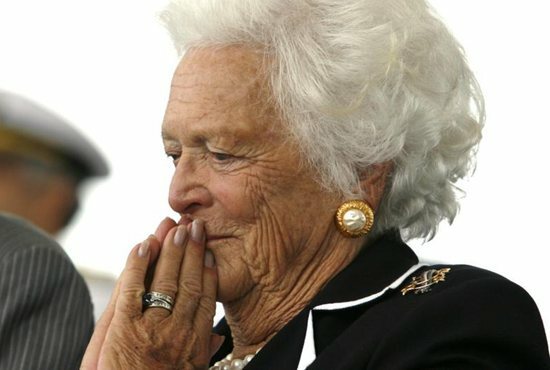 Barbara Bush, who for many years suffered from a thyroid disorder called Graves’ disease, had been in failing health. She was recently hospitalized for treatment of chronic obstructive pulmonary disease and congestive heart failure. A few days before her death she announced she wanted no more treatments of any kind, just “comfort care” at home. She and President George H.W. Bush were the longest married of any presidential couple in U.S. history. Married Jan. 6, 1945, they had six children — George Walker Bush (the future 43rd president of the U.S.), Robin Bush, Jeb Bush (the future Florida governor), Neil Mallon Bush, Marvin Pierce Bush and Dorothy Bush Koch. Their daughter Robin died from leukemia at age 3 in 1953. Bush was one of only two first ladies who had a child who was elected president. The other was Abigail Adams, wife of John Adams and mother of John Quincy Adams. “I may be the only mother in America who knows exactly what their child is up to all the time,” Bush once said. She was first lady of the United States from 1989 to 1993. She had previously served as second lady of the United States from 1981 to 1989, when George H.W. Bush was vice president under Ronald Reagan. Born Barbara Pierce in New York City June 8, 1925, she was 16 and on Christmas break from boarding school when she met her future husband at a dance. George was a student at Phillips Academy in Andover, Massachusetts. Eighteen months later, they were engaged to be married, just before he went off to World War II as a Navy torpedo bomber pilot. He named three of his planes after her: Barbara, Barbara II and Barbara III. When he returned on leave, she had discontinued her studies at Smith College in Northampton, Massachusetts, and they were married two weeks later at the First Presbyterian Church in Rye, New York. They moved to Midland, Texas, where he entered political life, in 1950. As first lady, Bush worked to advance the cause of universal literacy, founding the Barbara Bush Foundation for Family Literacy. Besides her husband, now 93, and children, she is survived by 14 grandchildren and seven great-grandchildren.